Making real a business, altering a work situation, or developing an exercise or health plan. She’s a walking encyclopedia. Any information you want, this woman has it, and as such she can mingle with almost anyone. She can talk science with the scientists, history with the historians, literature with the poets. She knows obscure facts, strange tid-bits, and she seems to love nothing better than to pour it all out, give it away like gifts to help people. In fact this woman is likely to be involved in a job that includes talking: psychology, politics, radio, or information gathering, like the sciences. She absorbs information, and is able to relate it back succinctly, clearly, simply, so everyone can understand and use it; men who aren’t threatened by her (and many are!) gather round to listen to her beautiful voice, fascinated. You can always pick out this woman in a crowd as she is always stylish in her own, unique way; almost eccentric in dress. The problem? These queens can be the most “queen-like.” Aloof, even cold. They believe the right facts can fix any problem, and will offer that instead of sympathy or warmth. They also like to know everything, and are likely to listen in on conversations, read diaries. Worse, they might well spread what they’ve learned thinking it will do good. They mean well, but their need to know and solve problems often outweighs other considerations. I thought Ruby’s divisive and manipulative nature was well suited to this card. Ruby possesses knowledge unbeknownst to all but her, Lillith and Lucifer, aswell as Dean going to hell, her demon knife and fixing the colt. She spreads parts of information, playing everyone off of each other, with a “need to know and solve problems [which] often outweighs other considerations. She makes real the situations she intends and knows how to ‘mingle’, absorb and distribute information to achieve an end. There is of course her beautiful side. I chose Ruby 1.0 because I felt that she built the foundations, she had the most work to do, introducing herself, gaining trust, whereas Ruby 2.0 only needed to return to Sam, from there he was easily manipulated. Plus I liked the first Ruby more! 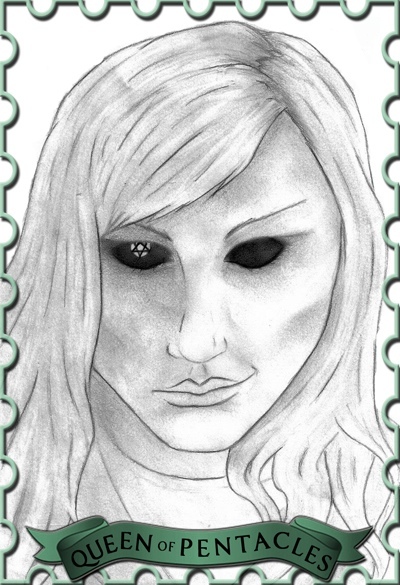 The pentacle hidden in her eye is inverted so that her purpose is nefarious.